This book provides you with a first look at Greg, whereas Keith introduces you to the story. With Circumstances of Childhood, John W. Howell has created a unique story of friendship, loss, and much more. Greg and Keith are very likeable characters; as the story proceeded, I became their invisible friend. The story comprises a variety of craftily elaborated characters with depth and interesting interactions until the last page. I had a great time reading Circumstances of Childhood – it is a very intriguing and intense read; it turned me into an invisible ally and/or friend of the believable protagonists. I was drawn into the story right away, eager to learn more. Some of the events may start a new train of thoughts, maybe even shine a new light on something familiar. This is for you if you like thrillers with excellent twists, interesting and complex characters, a touch of the paranormal, and – food for thought. A compelling and remarkable read by a master of story-telling. John W, Howell began his writing as a full-time occupation after an extensive business career. His specialty is thriller fiction novels, but John also writes poetry and short stories. His first book, My GRL, introduces the exciting adventures of the book’s central character, John J. Cannon. The second Cannon novel, His Revenge, continues the adventure, while the final book in the trilogy, Our Justice, launched in September 2016. Circumstances of Childhood in October 1st 2017. The latest, The Contract, was launched the week of June 4th, 2018. All books are available on Amazon in paperback and Kindle editions. What about you? What did you think about Circumstances of Childhood? Or – if you did not yet read Circumstances of Childhood – are you now interested in reading it yourself? This entry was posted in Book Review and tagged book review, John W. Howell, suspense. Bookmark the permalink. Thanks for this mindful review, Karen. I’m a huge fan of John’s work. Hugs all around. Thank you very much, Teagan. We are all fans of John’s work, it seems. Hugs. A good review of John W. Howell’s book CIRCUMSTANCES OF CHILDHOOD. Thanks for your kind feedback, Suzanne. A fabulous review of John’s book. I also loved it. Thank you very much, Roberta. P. S. I liked that ‘durn’ book so much I returned the $100 check to Mr. Howell and scribbleed this note on the check: “Can’t have this much serious fun and deep thought with a book plus take yur e-pluribus-unum!!! Just send Willett! (She’s a lady we know and like!) Just, saying! Thanks, Billy Ray. I’m sure Karen is horrified at the thought of me even having a $100 to spend. I must say though, your review was excellent and I thank you for your appearance here today. Remind me again as to how much a bottle of Willett weighs? Karen Oberlaendar has written a lovely review of Circumstances of Childhood. 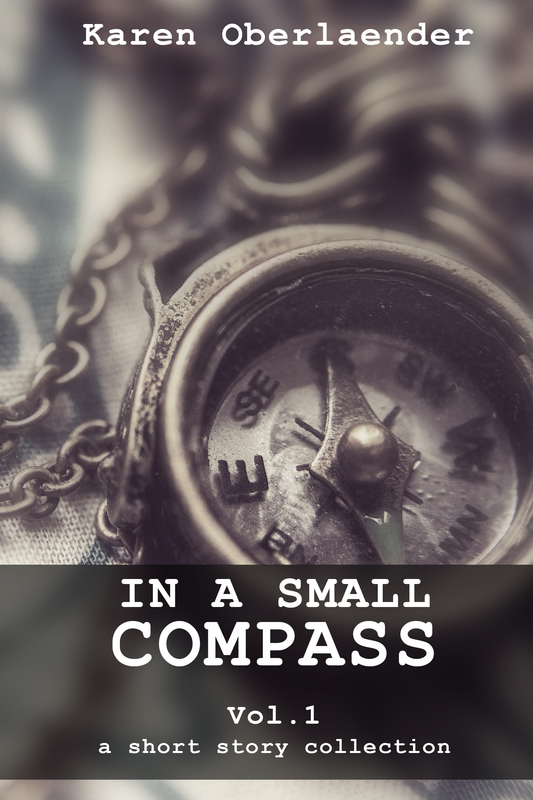 Karen is also an excellent author and her book of short stories titled In a Small Compass is available for free. Visit Karen’s blog and claim your copy. Karen is also a member of Rosie’s Book Review Team and a super reviewer. Thank you, Karen. Thank you, Karen, for the insightful review. I am so pleased you enjoyed the story since your opinion means a lot to me. Thank you for writing this unique story, John. I did my best to avoid spoilers. Your book will definitely be among my top five reads of 2018. I am so humbled by your comment, Karen. Thank you. I enjoyed the story. Great review, well deserved. This is a book that stays in your memory. Thank you, Inese. So nice of you to say so. It was my “kitchen sink,” story. I found it so much fun to write because I pretty much tossed convention aside. The Contract is in very much the same vein in being a cross genre work. Thank you again, Inese. Great review. I especially like your rating grid at the end. Wishing John all the best! I need to get better about posting my reviews on my blog. Hopefully soon (and with a new format). Thanks! Wonderful review of a wonderful story. I too enjoyed this one. John is also one of my favorite people and I’m glad to see him represented here. Even if I repeat myself: We share great taste. Thank you, Craig. The feeling is mutual. Nice review, Karen – I loved the mixture of thriller with a hint of paranormal in this book. Thank you, Teri. This is a brilliant concept I highly enjoyed as well.